Known as the summer flowering snapdragon Angelonia augustifolia (Angelonia serenita) is an excellent border plant. Flower spikes will reach around 60cm in height. Long lasting flowers and a drought tolerant plant make this a veru useful addition to the landscape. With many cultivars now being releases, lower growing types that will reach around 30 cm are nor being offered by some wholesale growers. Useful in the cottage garden as well as in mass plantings where color is required during summer. An excellent container plant, especially the lower growing types. 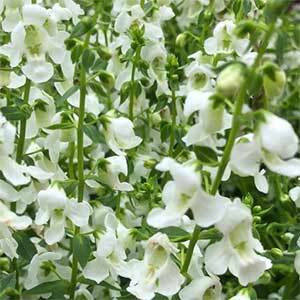 Angelonia augustifolia ‘Carita Cascade White ‘ – Smaller growing to 30 cm with white flowers.